2 tsp. dried thyme approx. 1. In a hot cast iron skillet, saute garlic and dried thyme in olive oil. Add crushed tomatoes, red pepper flakes, red wine, salt and pepper. Simmer for about 30 minutes on low heat. 2. 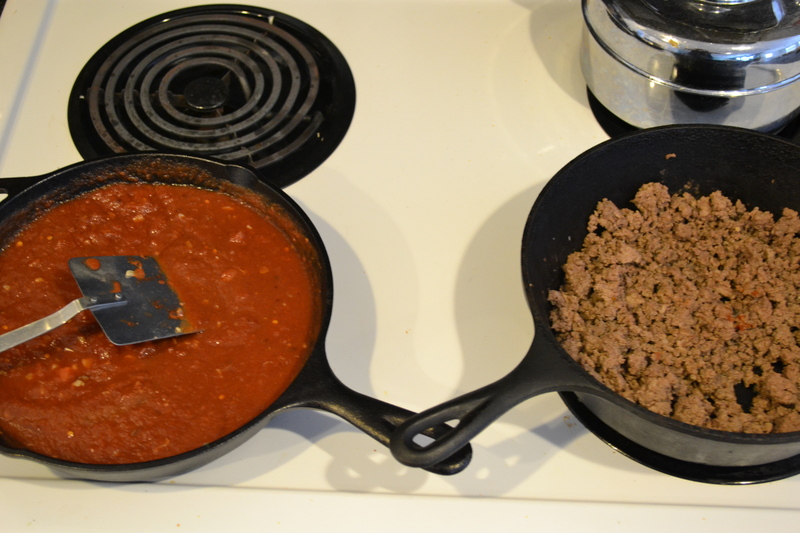 In another skillet, brown ground meat, seasoned with salt and pepper mix. Ground venison does not need to be drained. There is no fat to render out. It will, however, release some water. I always leave it in since it is like a delicious stock. Add tomato mixture to browned meat. Continue simmering. 3. 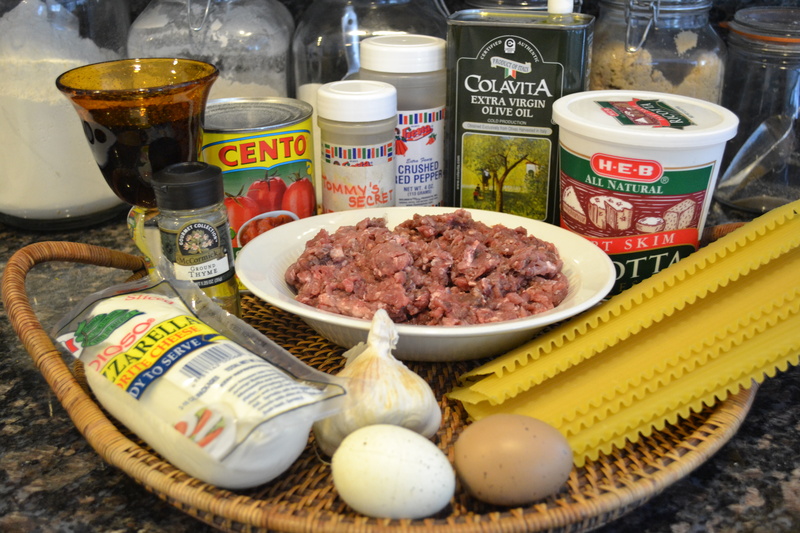 In a bowl, mix ricotta cheese, two eggs, salt, and thyme until smooth.
.*PLEASE NOTE THAT MY JUNIOR DEERSLAYER, BLESS HER HEART, ACCIDENTALLY PICKED UP LASAGNA NOODLES THAT DON’T NEED TO BE BOILED AHEAD. FYI…. DON’T USE THESE. We found them lacking in texture and “toothiness” that pasta lovers know and recognize. 5. 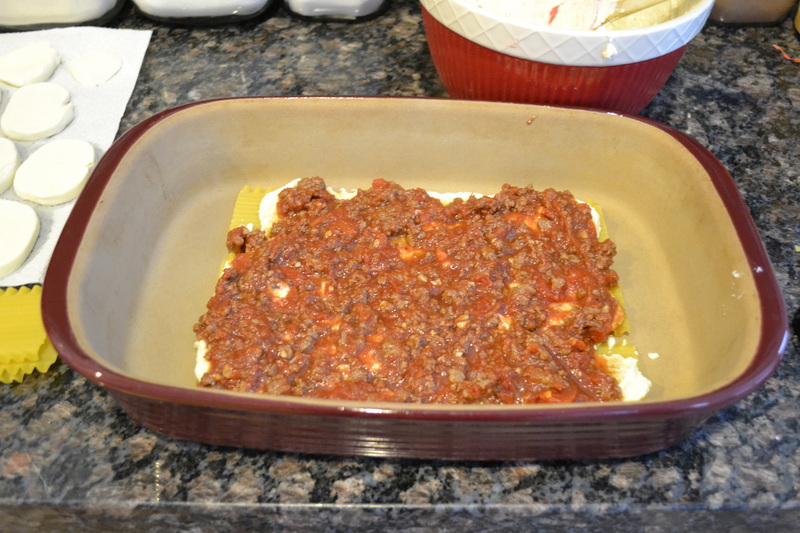 In a 9 x 13 baking dish, layer 3 lasagna noodles across the bottom. Spread half the ricotta mixture atop the noodles. I use a rubber spatula for this. 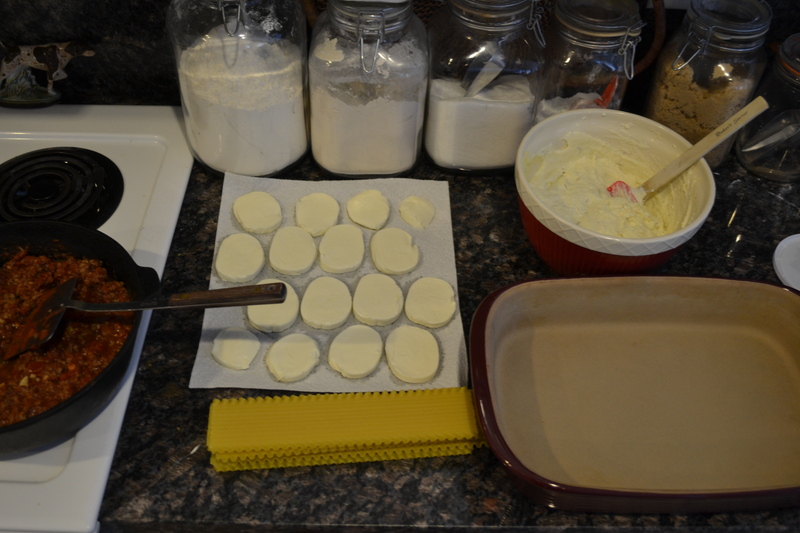 Cover the ricotta with approx. 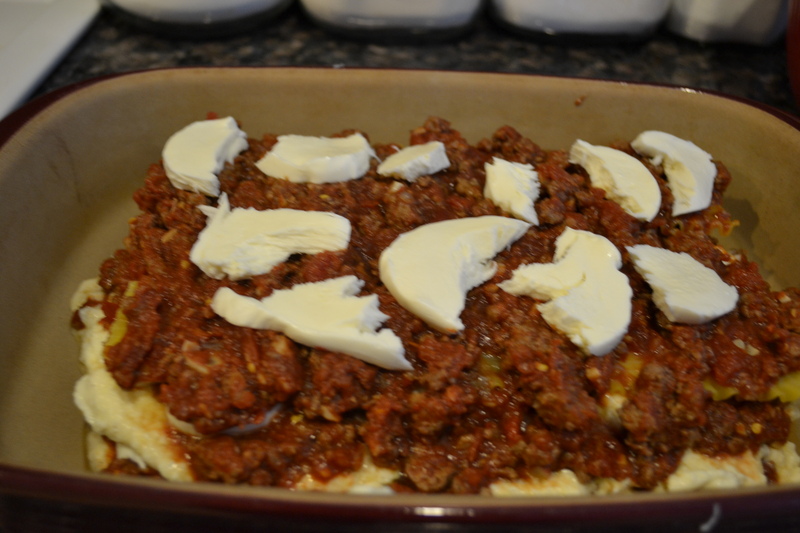 1/3 of the meat sauce, followed by a layer of torn mozzarella. Fresh mozzarella should be dried on a paper towel. 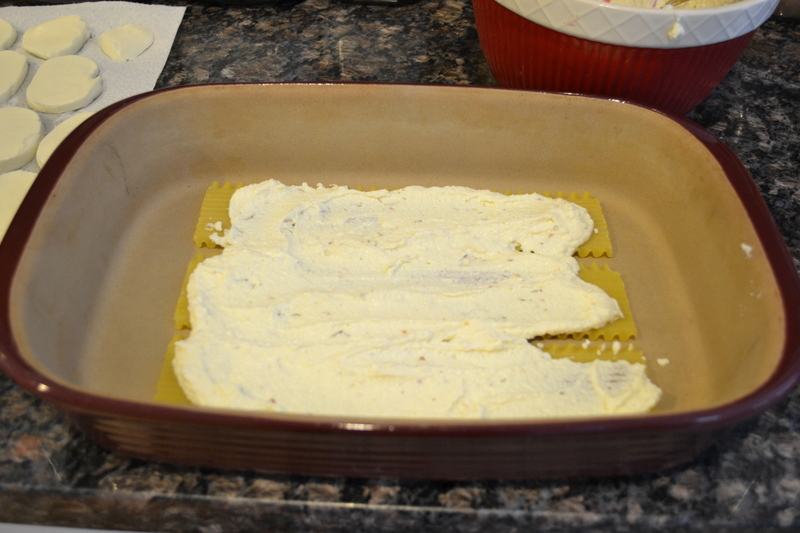 Continue the layering process until the 3rd layer of lasagna noodles has been spread. This is the top layer and should be spread with remaining sauce to cover noodles completely. It is important that the noodles be covered completely so that they do not dry out. Mozzarella should top the lasagna to your liking. 6. Bake in a 350 degree oven for about 1 hour or bubbly and cheese is melted. 7. Allow to rest for 10 to 15 minutes before serving to allow lasagna to set so moisture can be reabsorbed and cutting will be easier. Thank u 4 the venison recipe. Have a log cabin & husbands starting to hunt. No antibiotics, grass/field fed is so great! I’m so glad you enjoyed the recipe. I hope you find lots more that work for you. I really envy the log cabin! Wild game is about as healthy and “clean” as it comes!